Surf News Network, Feb 3, 2015 – Marine scientists are measuring 1,000 foot high waves in the Tasman Sea. The 1,000 footers are not surface ocean swells but ‘internal ocean waves’ which form, move and break like waves you surf, but do so deep down in the ocean. These mountainous swells move at about 6 miles per hour. “The wavelength between crests is about 100 miles, and they’re moving at jogging speed,” Robert Pinkel, professor of oceanography at Scripps Institution of Oceanography told Takepart. These waves are responsible for upwelling and all associated weather phenomenon affected by the resulting ocean temperature change. In the Tasman Sea the confluence of big tides, currents and underwater topography create ideal internal waves for study. 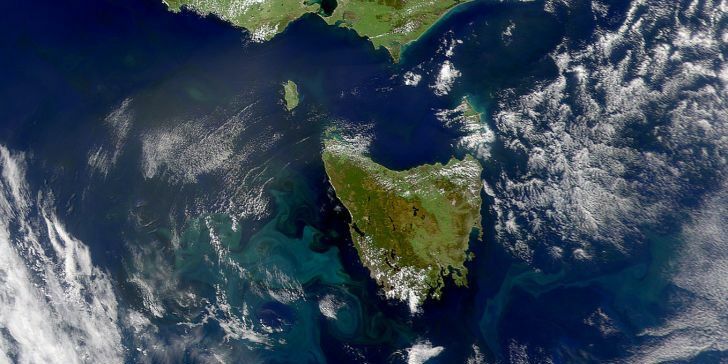 Once the wave forms it takes seven days for the 1,000 foot beast to move across to the southeast coast of Tasmania, where it detonates on the continental shelf. Once scientists better understand these waves, weather forecasting will take a huge leap forward.